Controls dandruff. Keeps scalp healthy. Himalaya Herbals Anti-Dandruff Hair Oil is a breakthrough anti-dandruff formula which effectively controls dandruff and relieves scalp itching. A uniquely formulated light and nonsticky herbal oil containing Tea Tree Oil and Neem, our hair oil exhibits proven anti-dandruff action. Rosemary stimulates the hair bulbs to enhance hair growth, and Sweet Indrajao relieves scalp itching. Safe to use on artificially colored or permed hair. 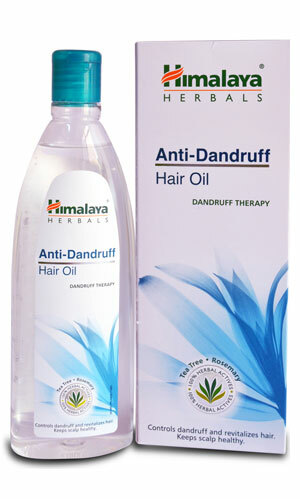 Massage Himalaya Herbals Anti-Dandruff Hair Oil liberally into the hair and scalp. For best results, wash hair with Himalaya Herbals Anti-Dandruff Shampoo after applying the Anti-Dandruff Hair Oil.